Our entire crew was sick this week. And by 'sick', I'm not talking street slang for 'rad' or 'awesome'. Though I was somewhat relieved that everyone was sick at the same time rather than each of us falling like dominoes, one right after the other. Jude missed two days of school. Yesterday I paid a visit to the urgent care to get tested for influenza. My sidekick, Indigo came along to keep me company. Be assured that if you go to the urgent care this time of year with a cough and a fever, you're going to be wearing a mask. This in fact turned out to be a handy way to pass the time. As we waited (and waited), we invented the game, "Guess if I'm smiling by looking only at my eyes." We both got it right every time. I also learned that masks can be turned into pretend parachutes and hang gliders. I was influenza negative, but had a throat infection, an ear infection and bronchitis. So this seemed like the perfect time to share my favorite 'sick' tea. (And by 'sick', I mean both sick and sick.) Any time I come down with so much as a sniffle, I make this tea. It may not be a cure all, but it always brings me some relief. Here's what you'll need. 1. Cut off a one inch piece of fresh ginger, peel it, and grate it with a fine grater. I like my ginger tea really spicy, so I grate it directly into a 2-cup glass measuring cup rather than into a tea ball. 2. Pour 12 ounces of boiling water over the ginger and let steep, covered, for 15 minutes. 3. Strain through a fine mesh strainer into your favorite mug. 4. Squeeze 1/2 of a lemon, a good dash of cayenne pepper, and honey to taste. Don't be stingy with the honey, either. 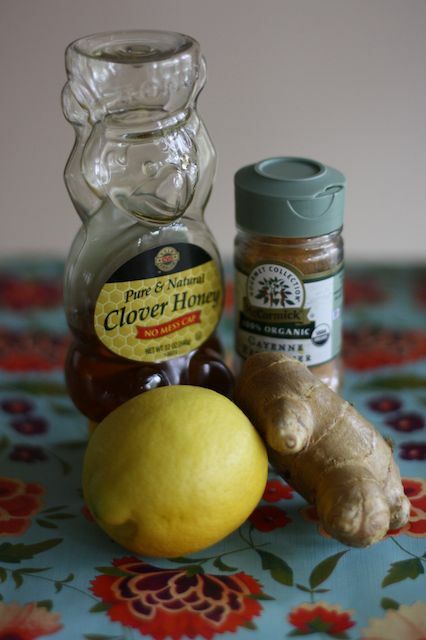 Did you read that honey worked better than over-the-counter cough medicines for reducing coughs? Ginger tea is great for colds, chills and stomachaches, too. (But if I were making it for a stomachache I would leave out the cayenne, lemon and honey.) No honey for kids under age one. If you're pregnant and in your first trimester, go easy on the ginger - don't drink more than one or two cups per day. Sounds like a perfect remedy! Thanks for sharing your recipe. Hope you are all back in full health.